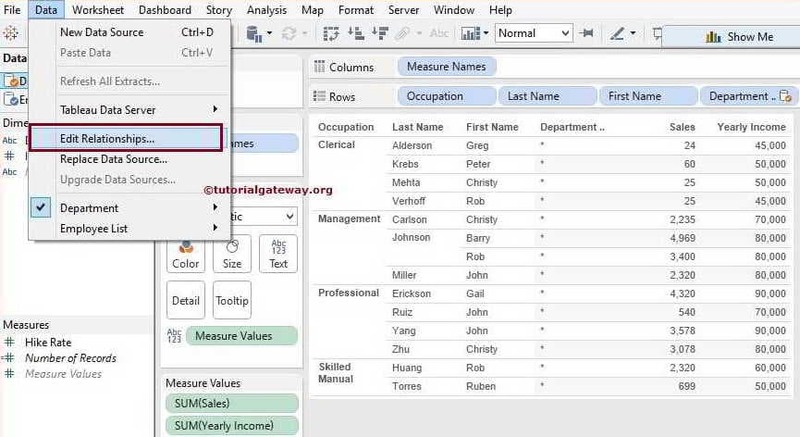 Data Blending in Tableau is very useful to join two data sources. 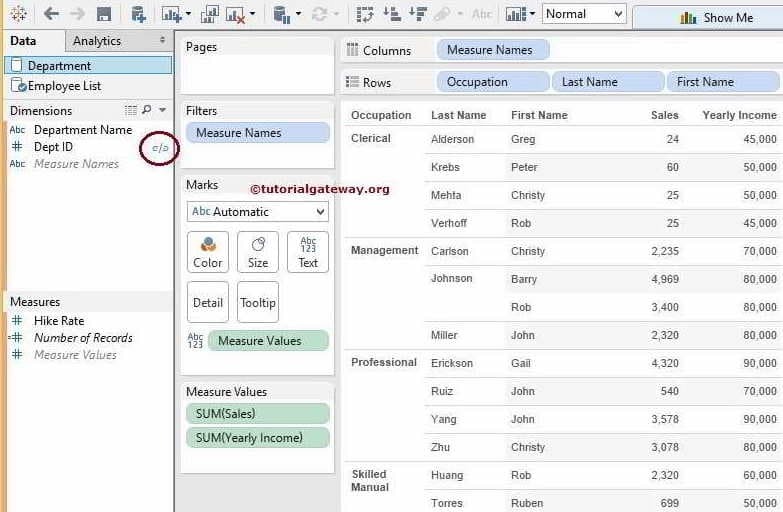 For example, If you want to generate a tableau report using multiple data sources (or different data sources) then we can simply use this Tableau Data Blending technique to join those data sources. 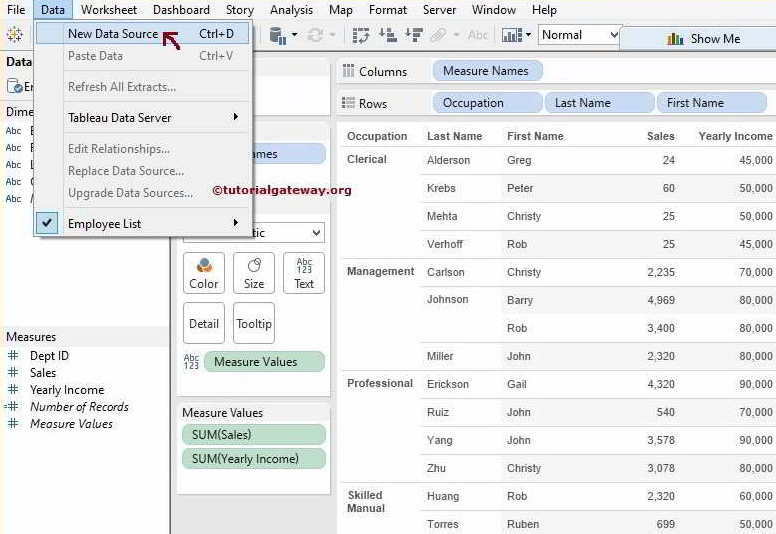 NOTE: In order to perform Data Blending in Tableau, We need at least one common field in both data sources. It doesn’t matter, whether it is integer or string. 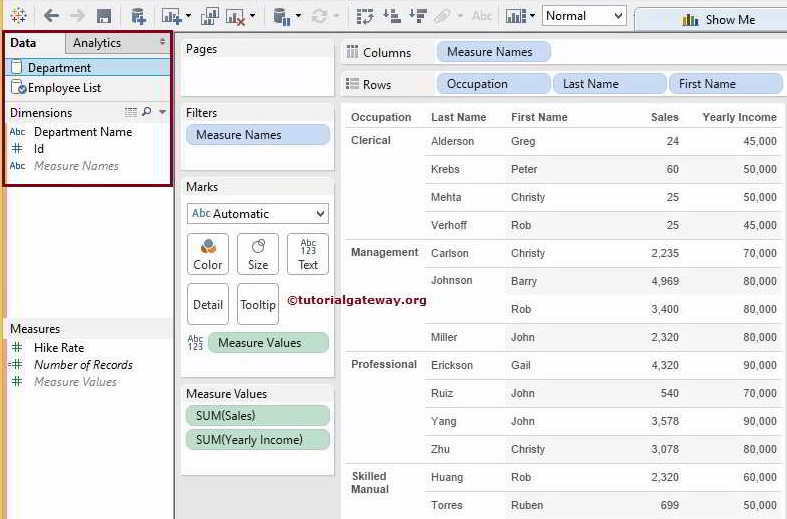 In this article, we will show you, how to perform Data Blending in Tableau with an example. 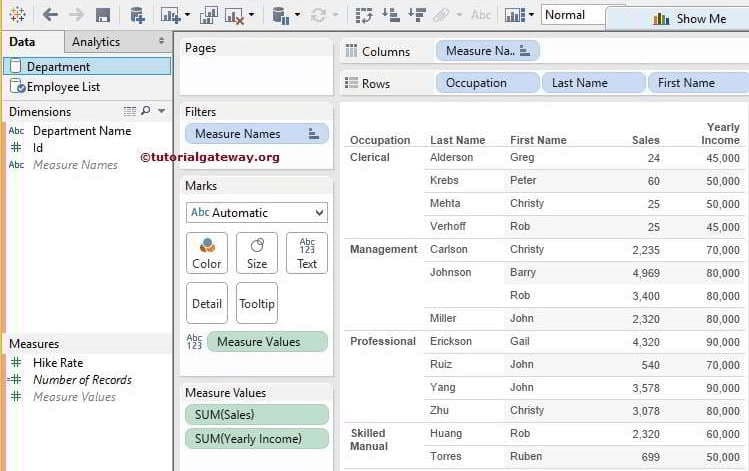 For this, we are going to use the data present in Excel Worksheet and SQL Server. 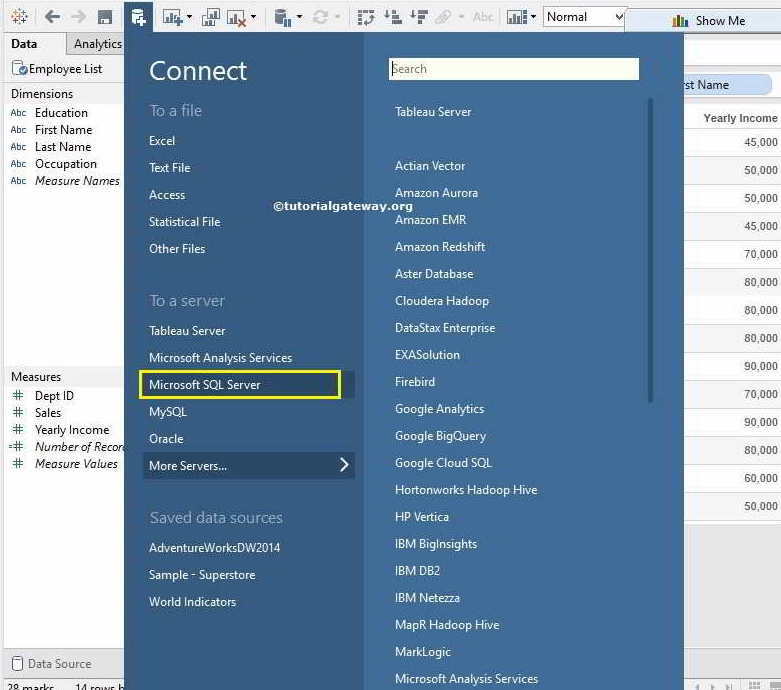 So, Please refer Connecting to Excel Files in Tableau and Connecting Tableau to SQL Server articles to understand the connection settings. 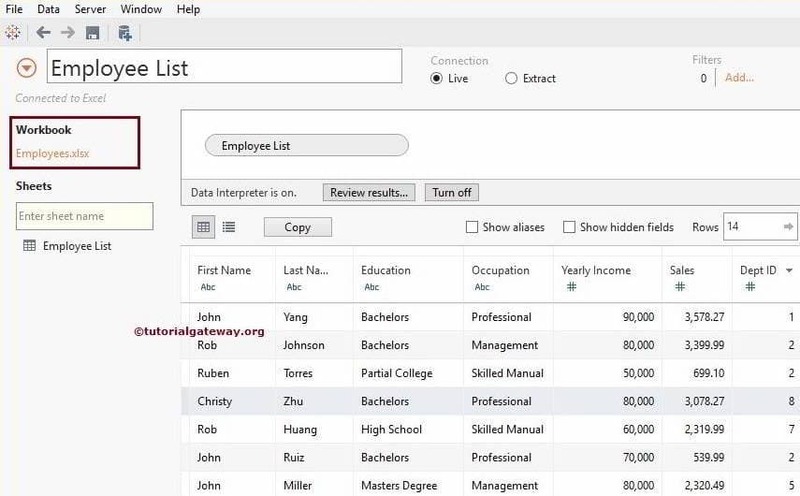 In this example, Our requirement is to create table report with employee first name, last name, occupation, Sales and yearly income. 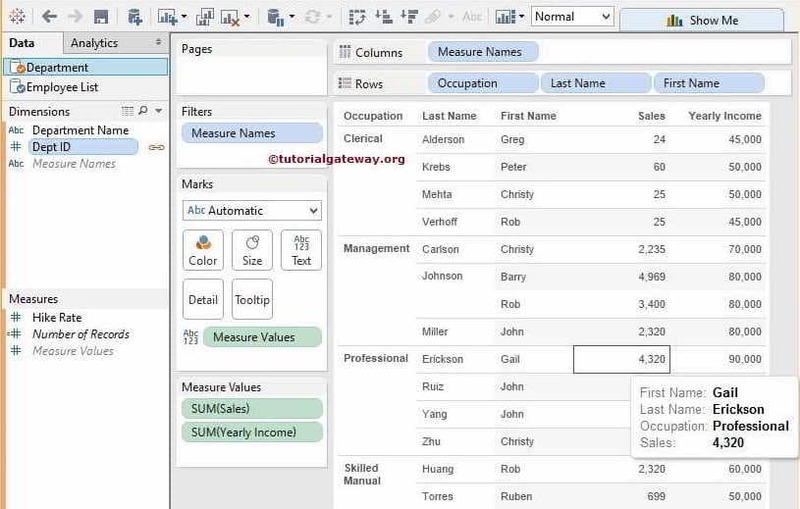 So, we created a simple table report with Occupation, Last name, First name on Rows and Sales Amount and Yearly income on columns. Let us see the report preview. Let us add the Department name to the Rows Card. 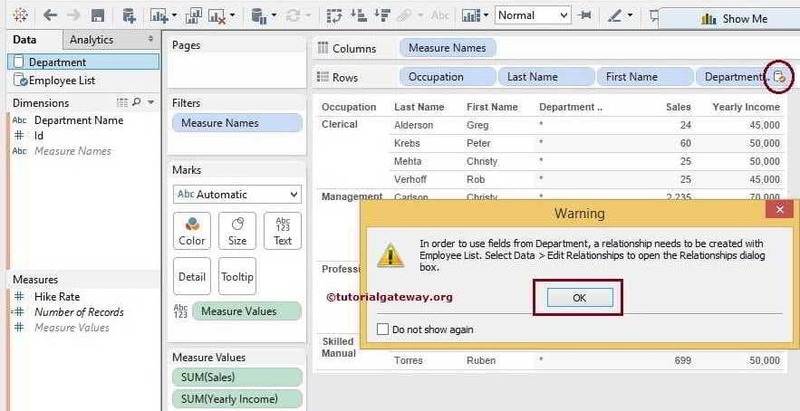 From the below screenshot you can observe that Tableau is displaying little orange tick mark at department name and also displaying the warning message. If you read the warning message, it is a pretty straightforward message saying that there is no relation between Employees and department. 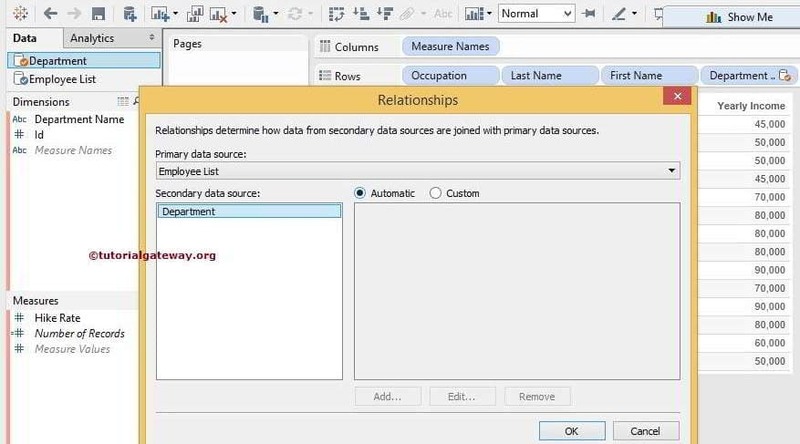 Relationship is very important in Tableau data blending so, please add the relation. 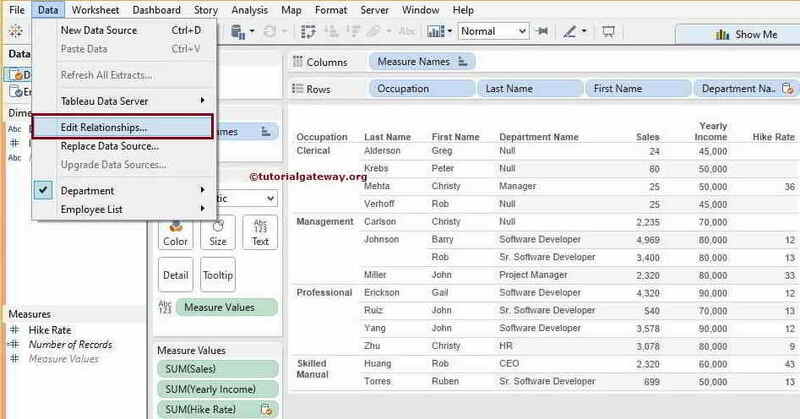 Once you select Edit Relationships.. option, a new Relationships window will be opened. 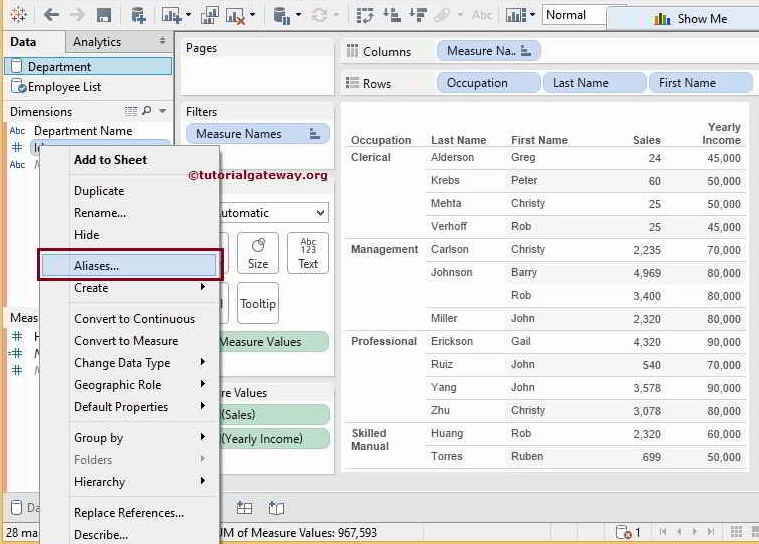 Following are the option available in this window. 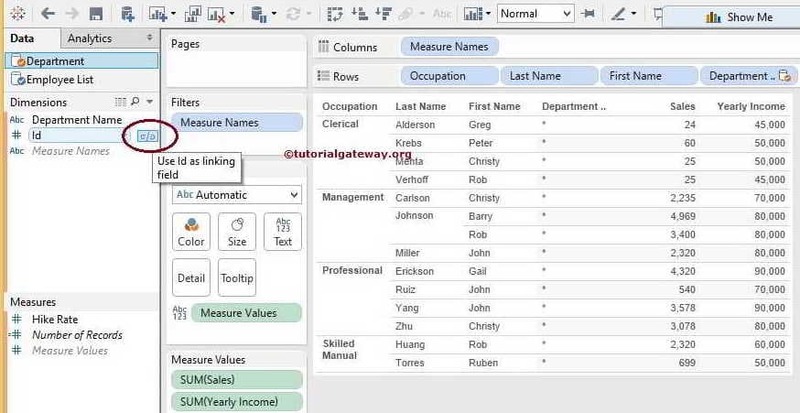 Automatic: If there are any common Filed names in both the data sources then tableau will automatically detect the possible relationship between those two fields. 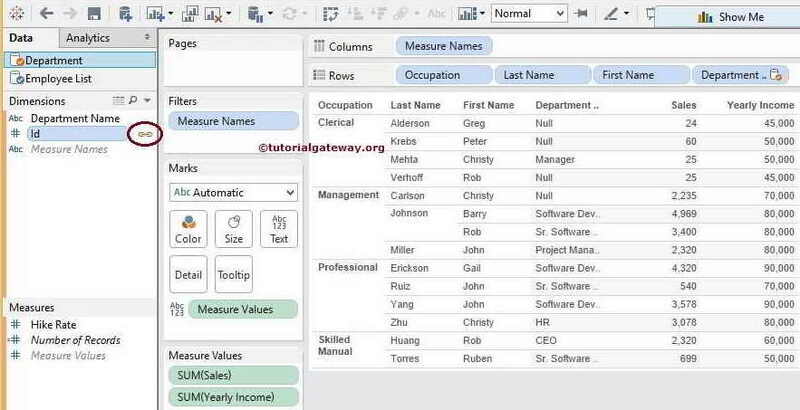 Dept ID in Employee table and Id in Department table are the key columns we are going to use for this Tableau Data Blending on Employee and Department table as shown below. 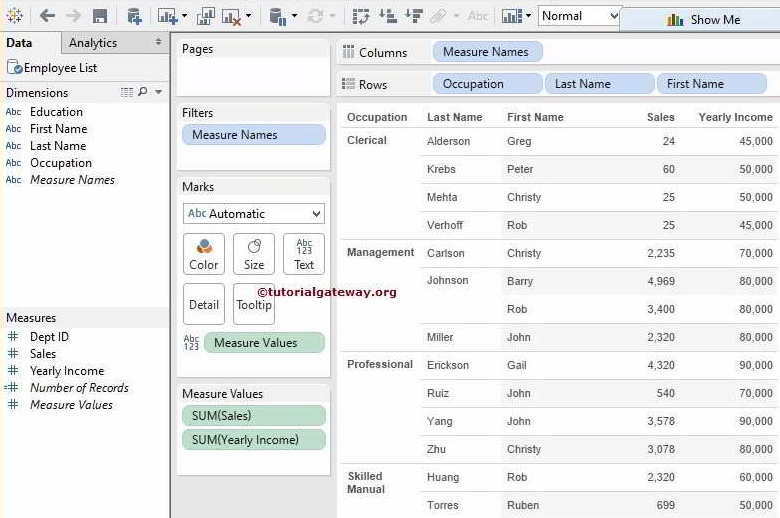 When you click the link button, link button colour will change to Orange colour and Our Department column is displaying data. 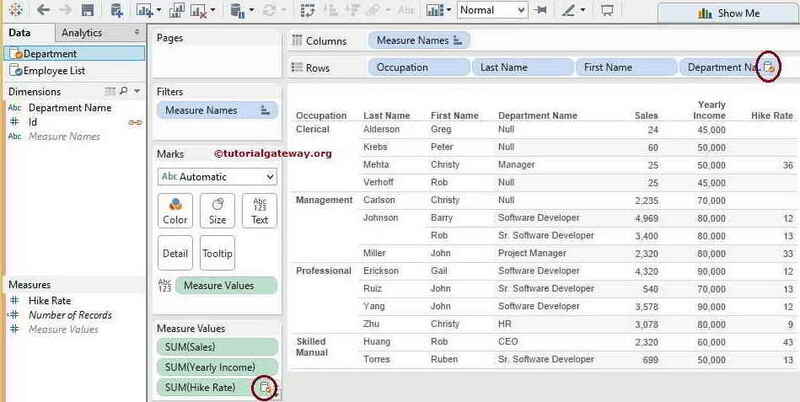 Remember, If there are no matching records in Department then Null values will be displayed. Let us add Hike Rate measure to complete our client requirements. 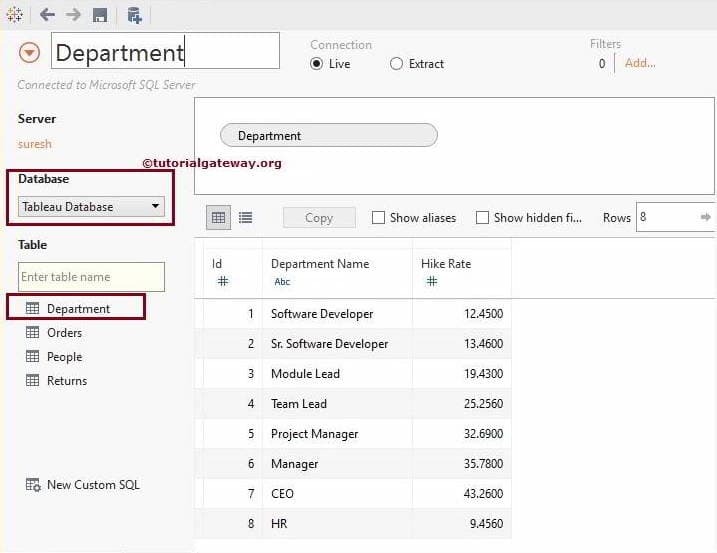 Once you click OK button, Tableau will automatically detect the relationship between Dept ID in Employee table and Dept ID in Department table. It means you don’t have to create a relationship on your own. Once you click on the link button, link button color will changed to Orange color as shown below. Let us add Department Name and Hike Rate to finish the business requirement. 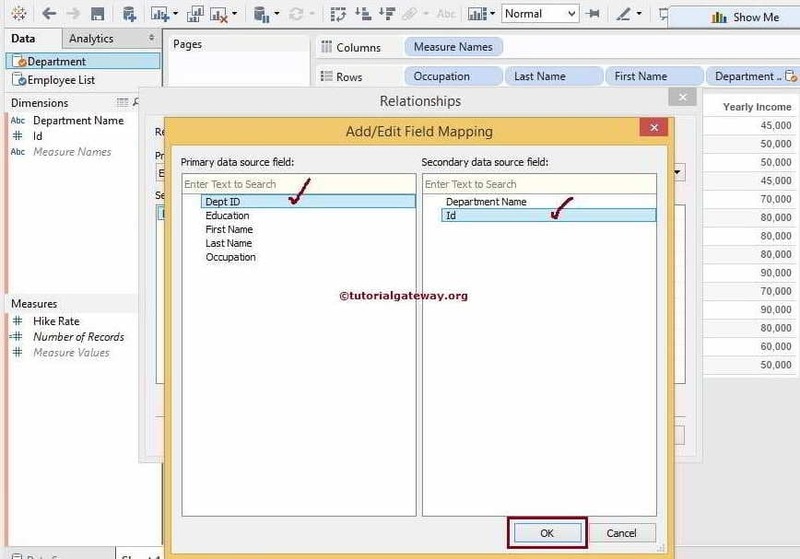 Once you select Edit Relationships.. option, a new Relationships window will open. 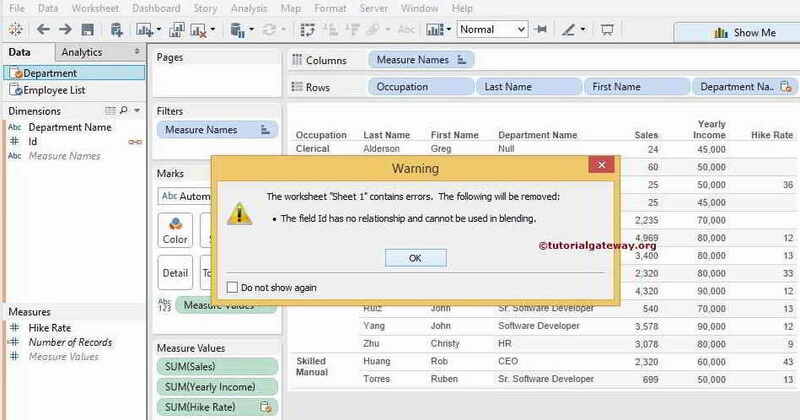 Please select the Relationship you want to remove and Click Remove button. 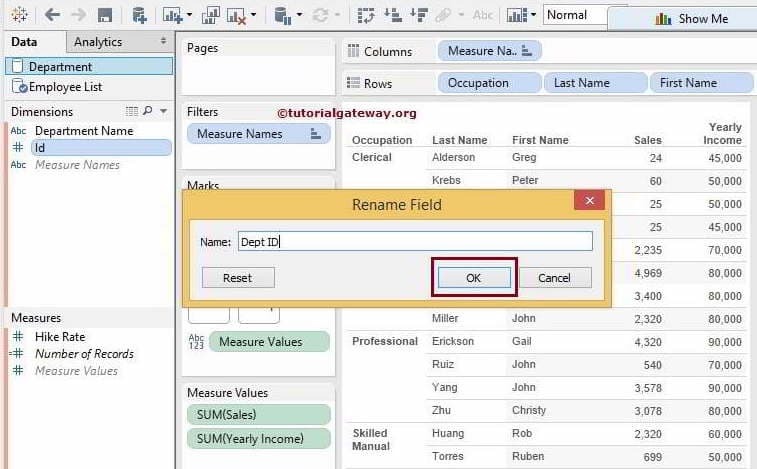 In this example we have only one relationship between Dept ID and Id so, we selected it and removed. 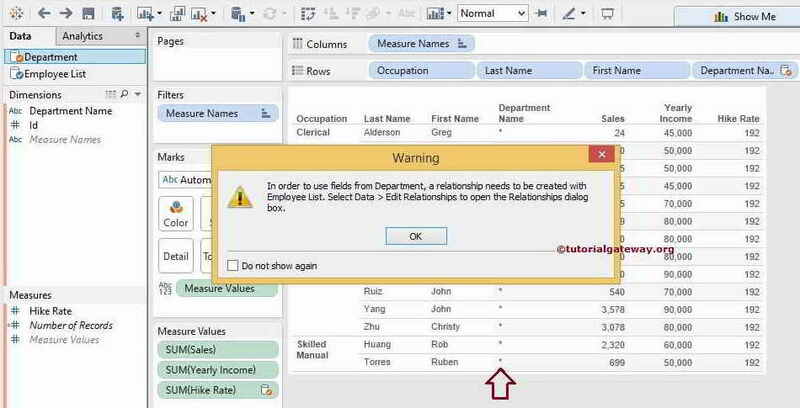 Following warning message is displayed because we are using Department Name and Hike Rate in Tableau report.